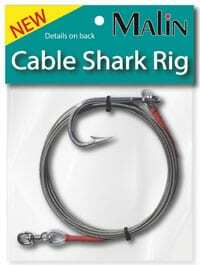 These professional shark rigs are made using the highest quality materials and are designed to withstand the rigors of catching sharks. We use 400 series SS hooks, Nylon Coated 49 Strand Stainless Steel cable, High Strength Swivels, Copper Crimp Sleeves, Chaff and Heat Shrinkable Tubing. The Heavy Duty rigs are available in 12 and 6-foot lengths, with breaking strengths of 250lb (9/0 hook), 400lb (10/0 hook) and 1,000lb (11/0 hook). The 6-footers are designed for casting from the surf, pier or anywhere else you may want to cast a shark bait from. 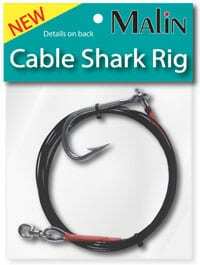 The Small Shark Rigs are made using uncoated 49 strand Stainless Steel cable, Natural or coffee colored. Available in 5 and 8-foot lengths, with breaking strengths of 270lb (9/0 hook), 160lb (7/0 hook) and 80lb (6/0 hook).